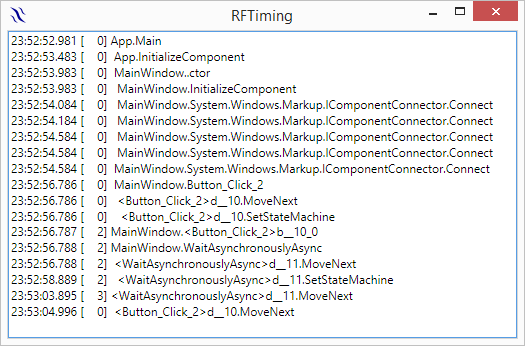 Runtime Flow API provides programmatic access to saved Runtime Flow monitoring data in a .rfd file from a standalone application, real time access to function calls from an extension dll, pause and resume monitoring. RuntimeFlowExt.dll .NET 4.0 library includes all API methods and definitions, you can find it in the portable package and in the installation directory (c:\Program Files (x86)\Runtime Flow). // Functions in the flow tree are stored as ids. RFClassGraphExt project is a Runtime Flow extension dll. 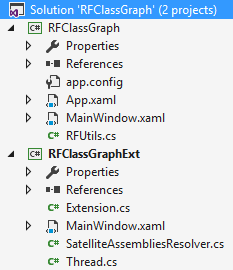 You need to place RFClassGraphExt.dll (with the msagl directory) in the Extensions directory in the portable files directory or in the Runtime Flow installation directory (c:\Program Files (x86)\Runtime Flow). It creates a window that shows the same class relationship diagram as above, but now in real time as monitoring is running. The RFDtoTXT command line utility extract the full method calls sequence from a .rfd file and saves it in a plaint text file. Runtime Flow is not designed for profiling and doesn't collect timing information. 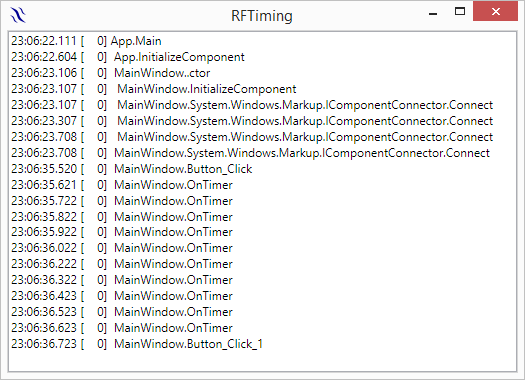 Nevertheless, from an extension in FunctionEnter and FunctionLeave handlers you can record current time and display it along with method call information.